Daily Calendar Journal Writing Blogging…. 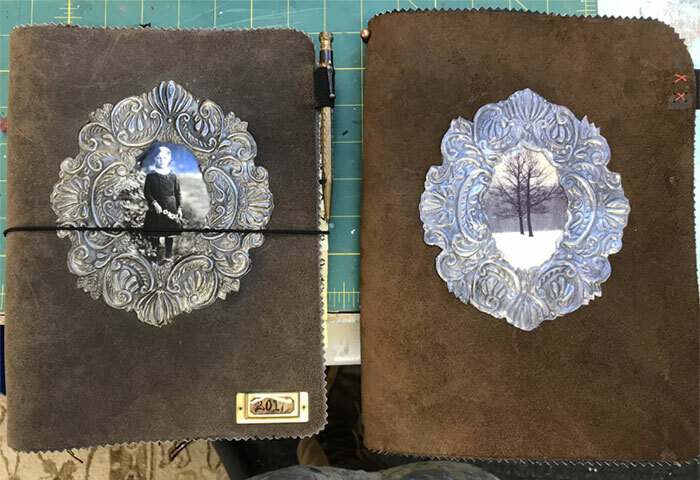 If you are a handmade book lover and don’t know Leslie Marsh, please go and fall into a rabbit hole clicking on all her beautiful creations. You will be amazed and inspired. 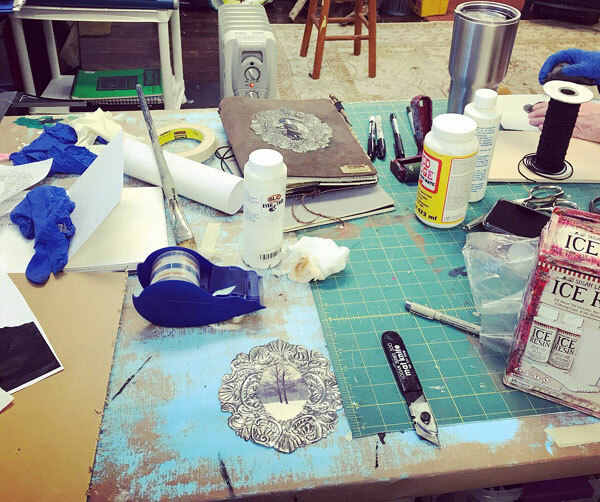 I was fortunate to have had a chance to hang out with Leslie a few times this winter and create with her in my studio. She was so gracious to walk me through on how to create one of her leather bound calendar journals. I had admired her journal/calendar and desperately needed something like that to organize my mind clutter. I had been hand drawing my own calendars into my journals and then doing organizing in the following pages, akin to bullet journaling. And then also doing my regular writing and list making. It was working….but it was also a big mess and didn’t really help me feel all that organized. When I saw how Leslie made and organized her calendar/journal, I was like: YES. NEED. I printed out calendar pages for 2019 and it was already formatted so that everything would line up once folded. I did a simple pamphlet stitch to bind the pages together. I used an old map as the covers of my calendar. I could have bound all the notebooks within this book, but to save time I bought a pack of moleskin journals that would fit. Those are the grey covered notebooks you see. 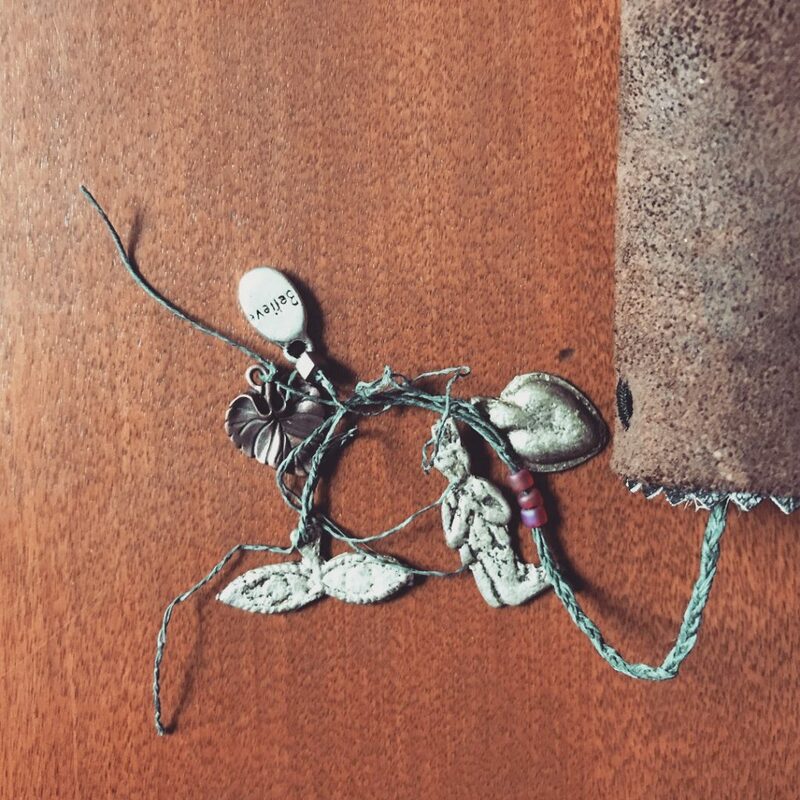 So in all there are three notebooks within the leather cover. 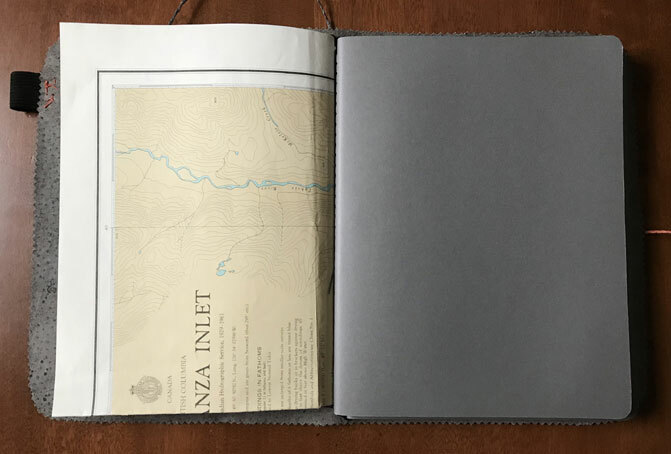 We had bound in an elastic cord into the leather cover so that each notebook is held in place. When a notebook gets filled, I can just remove the filled book and then replace it! 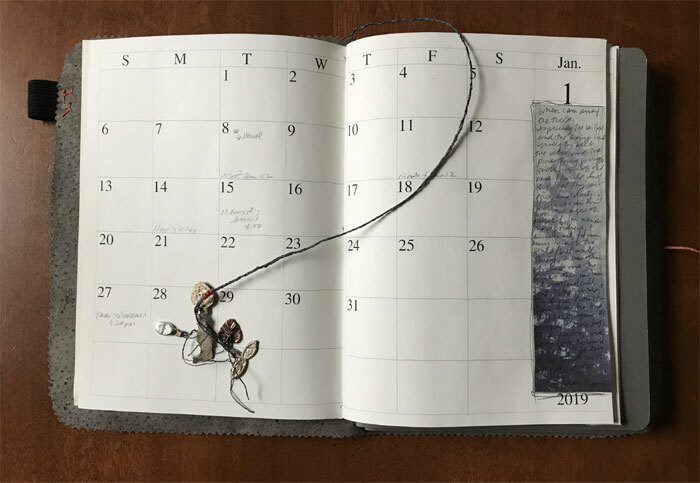 The first book with the map cover is the 2019 calendar. The second book is where I do my monthly, weekly and daily bullet journaling of what needs to get done- personally, business and studio. I always have those 3 columns. The personal includes things that I need to get done for home, garden and family and includes appointments, chores, school events, various sports, field trips, etc etc etc. The middle column are things that need to get done for the business side of my art- quickbooks, writing, submission deadlines, ordering frames, paying bills, emails, etc etc. Then the 3rd column is what needs to get done in the studio in order to stay on task with all the deadlines and various studio goals. All the making that needs to happen. I may sound nuts. But seriously if I don’t write things down, I will not do it. I wander. I stall. I get distracted. And I will forget. I cannot tell you how many times I have double scheduled things with my kids or always feeling like I don’t know what’s going on. It’s crazy-making. Or that weeks go by since I decided I do a certain task and then it’s still not done. How does that happen? Time passes and nothing that I wanted to get done gets done. I have realized this about myself and that it’s been getting worse! Digital calendars do not work for me. I have to write it down. 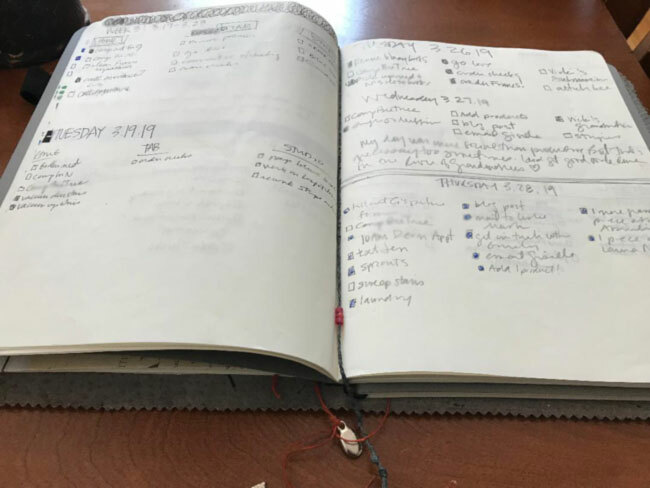 I have seen really amazing and beautiful bullet journaling online. Everything is perfectly lined up and illustrated with artistic calligraphy…yeah, that’s not mine. Mine is messy, imperfect and it’s literally my saving grace. No time for pretty. The third blank notebook is literally a brain dump book. It is where I do brainstorming for studio ideas. Jot down notes on research for a painting or concept. Lists of painting titles and what exhibit they will head to. It’s really helpful to have a dedicated notebook for that. But not hiding in a pile somewhere. That’s not helpful. Having it with my calendar and my bullet journal in one place is very helpful. So, there it is! So grateful that Leslie shared her calendar/journal with me. It’s been so helpful. If you struggle with organizing the many facets of your life, I feel you! I also signed up for a personal challenge. 100 days of blogging/journaling. I’ve done the 100 day project before on Instagram. I’ve enjoyed it, but this year I have too much on my plate to do this. But journaling I can do! This is my third blog in a row. I won’t always blog. Sometimes it will be in a book. But I always say I don’t blog and I don’t journal enough. So this is my attempt to get the practice going again. I won’t be visually documenting it, so this will be for me. But wanted to share the intention as that always helps with the follow through.